This last Saturday night Shira and I ventured out for first visit to Native Foods Cafe, specifically the restaurant in Falls Church. I was pretty much blown away by the menu, with absolutely no idea what I should try first. 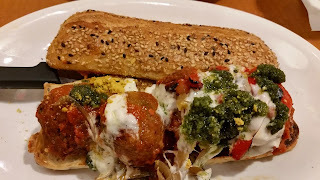 In the end, I got a Super Italian Meatball Sub, Shira got a Kung Pao (I think) bowl, and we split the Japanese Sesame Crusted Chicken Bites. I think it's always a little risky ordering something I make myself. What if I like their "meatball sub" as much as I like the one I make at home? That sort of defeats the purpose of going out, no? Luckily, their version far surpassed anything I've made. That's impressive, considering I usually use real cheese and they used vegan cheese. I'm telling you, everything from the bun to the sauce was perfect. 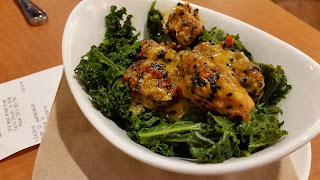 And the chicken bites - man, those were great. 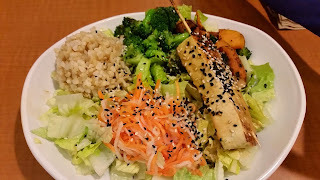 The overall atmosphere / experience reminded me very much of Noodles & Company. Which is actually a good thing, as I like their practical you-order-they-deliver-it setup. For Saturday night, I suppose it would have been nice to have had real table service. But I'll gladly take the casual atmosphere and a menu full of amazing choices; then a more formal experience and a couple of basic menu selections to pick from. Apparently there's a DC location which we've never been to. The Falls Church location was just too convenient to pass up (what, with lots of available parking). Interesting bonus: as we pulled out of the parking lot, Shira remarked that the Indian Restaurant next a few doors down was the very first place we'd eaten Indian food. Hard to believe there was a time when Indian Food was considered especially exotic. I'm telling you, Native Foods Cafe is worth a try. Dude. Got another Dell. So far, Loving it.